A little bit of sun exposure is healthy for us. Our bodies need that to get its daily dose of Vitamin D. In fact, experts recommend an average of 20 minutes a day of sun exposure to optimize the health benefits of the sun. However, if the body gets too much sun, or too much tanning, a lot of great damage to the skin may occur. In the long run, the skin gets weathered and lose its youthful look, dried out, wrinkled, or worst, one can get skin cancer. Thankfully, scientists invent the Sunscreen to come to the rescue. A Sunscreen or Sunblock is a lotion, cream or ointment that we apply to the skin to absorb or reflect the sun’s ultraviolet (UV) radiation to protect us from the harmful effects of too much exposure to the sun. Doctors and the FDA strictly recommend applying sunscreen with SPF 15 – 30 over the exposed parts of the body after 20 minutes of sun bathing or whenever it gets wet after swimming or sweating. This is where we see how relevant a bottle of sunscreen is. It is not just an accessory but an essential ‘amulet’ that we should carry around to protect us from the deadly effects sun. Diving deeper, the sunscreen is actually formulated uniquely and has to go through complex processing. 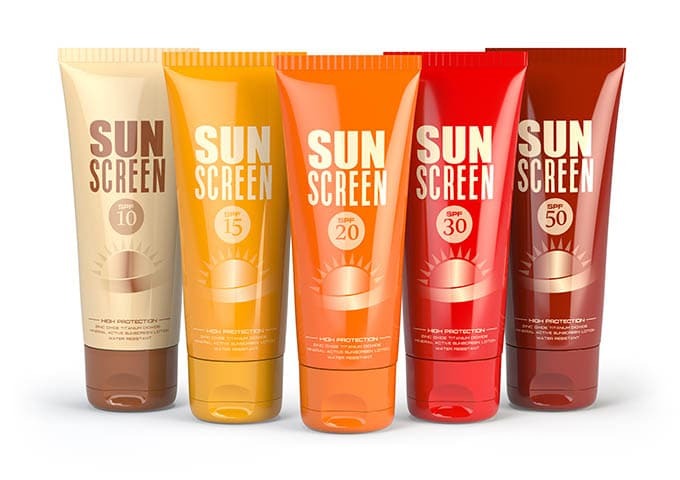 The manufacturing technique of sunscreens plays a vital role in optimizing the performance of permitted ingredients, as there are certain restrictions in the use of some UV filters. Sunscreens are commonly in the form of sun milk, which is a liquid emulsion. An emulsion is a mixture of either oil-in-water or water-in-oil. Sunscreens can also come in the form of cream , oil, spray, or gel. The ingredients for each type of sunscreen or suntan are almost the same, with a few difference in its formulation. The formulation for each determines the specific Sun Protection Factor (SPF) that is needed to be achieved. Avobenzone or Parsol is an oil-soluble ingredient used in sunscreen products to absorb the full spectrum of UVA rays. FDA has determined this product as safe up to 3% concentration. Other synthetic ingredients for spectrum protection are the benzophenone and oxybenzone, which absorbs UV light. A popular natural mineral in sunscreens is Titanium dioxide, which scatters UV light instead of absorbing it. It has a whitening effect in the higher SPF ratings. Oxidation of oils is decreased by this natural mineral, thus preventing mixture degradation. Antioxidants such as Sesame oil, Vitamins E and C, rice bran and others are used further inhibits oxidation. Sunscreen formulation contain skin soothing and moisturizing additives such as aloe and chamomile. These coat the skin, forming a physical barrier that prevents the loss of water and produces a rejuvenating effect on the skin. A complete ingredients dispersion together with obtaining the right UV filter and absorbers particle size are detrimental in producing an effective sunscreen lotion for UV protection. The oil phase ingredients, such as stearyl alcohol, vaseline, preservatives, paraffin oil, and stearic acid etc, are dispersed into the oil kettle. The water phase ingredients, such as titanium pigment, propylene glycol, triethanolamine, carbopol emulsifiers and stabilizers are prepared separately and dispersed into the water tank together. UV filters and absorbers are supplied as dry powder or dispersed in advance in either oil or aqueous bases. These”micronized oxides” are mixed with water or added to the product once the emulsion has been formed according to raw material type and formulation requirements. Mixing will be continuous until the mixture is finally homogenized. Thickening agents and suspensions may be prone to incomplete hydration which negatively affects SPF. Material build-up can surround the vessel walls. The emulsion should be stable with the minimum addition of emulsifiers and stabilizers as certain additives can reduce SPF. Difficulty in breaking down UV absorbers as these are supplied in micronized form in oil or water bases. When temperature is not regulated properly, some ingredients may be prone to degradation. Difficulty in producing the proper emulsion due to poor agitator action, especially when using conventional agitators. Upon starting the mixer the solid/powdered ingredients are added. The mixer induces powerful shear between the ingredients as they move around at various speeds. In effect, they create multiple points of deformation within their contact areas. A powerful suction is created by the high-speed rotation of the rotor which will draw the ingredients into the workhead where they will be thoroughly mixed. The process continues until the mixture is deagglomerated. Once the powdered ingredients have been fully dispersed in the continuous liquid phase, the dispersed phase is added. As the “dispersed” phase is added, the high shear mixing operation of the rotor/stator workhead immensely reduces globule size to ensure a uniform emulsion is rapidly formed. The micronized ingredients are added at this stage and dispersed in the emulsion. The high shear mixing action of the workhead forms a uniform and stable emulsion in a short while. Fast and convenient of mixing, emulsifying and homogenizing components as compared to the length of time it takes to get the job done by other conventional mixers. Efficient dispersion highly enhances color strength. Ginhong Sunscreen Mixer is capable of attaining uniform and homogeneous emulsion, with good physical and chemical properties. Heating may not be required In many cases heating is not required, reducing costs and risk of degradation of heat sensitive ingredients. The mixer is equipped with a Scraper made of a Teflon or a non-stick coating. This material is easy to clean, hard to be dissolved in all solvents and can withstand high temperatures. The Scraper gathers material wastes which can be collected without process interruption. Ginhong’s High Shear Mixer provides high energy in mixing that homogenizes, solubilizes, suspends, disperses and disintegrates ingredients. For large or bulk volumes of processing materials and where space limitation is not much of a concern. More compact configuration than the Batch High Shear Mixer. Suitable and recommended for manufacturing plants with limited space. Vacuum Emulsifier Homogenizer is a type of mixer which utilizes the many significant functions of vacuum to improve the performance of mixing and product handling and to achieve the best mixing results. Vacuum serves as controlling the mixing environment to prevent degradation of sensitive ingredients. In this video, we can see Ginhong’s expertise in making Sunscreen Lotion Manufacturing Mixers.